Hurom welcomes a new addition to its family of award-winning juicers, the Alpha Series. Hurom H-AA is one of the two new third-generation juice extractors gaining an Alpha status in the juicer market. So What’s New with Hurom HAA Slow Juicer? Hurom H-AA brings you elegance at new heights incorporating smooth curves that become slimmer in the back, even more, slimmer than previous models. The bottom has wavy curves which are both aesthetically appealing and functional, making it easy to move around. The new auger and drum design improve the overall operation and juice extraction efficiency. It features a new transparent hopper for obvious reasons. The spinning brush speed was reduced to 17 RPM to prevent over-flowing and foam build up. Ice cream maker attachment is included, perfect for making healthy frozen treats. Aside from the ice cream making capability, this machine is pretty similar to the Hurom HH Elite. Since the Hurom H-AA Slow Juicer weighs less and includes a slimmer, wavy design at the base, it is easier to store and move around the kitchen if you lack the counter space. The design at the bottom ensures a better grip. The duplicate safety sensors do not allow for operation unless it is properly assembled. It comes with a control lever that allows you to control the level of pulp, if any, in your juice. It features three strainers—fine, coarse, and an ice cream strainer. If you would like to make soups or juice soft fruits, then select the coarse strainer. The fine strainer is for everything else. The ice cream strainer is self-explanatory. Be certain to cut large fibrous and dense items into smaller pieces so that they fit down into the feed chute. 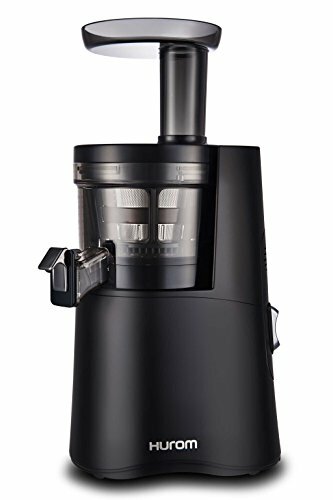 Vertical juicers have gravity to assist with feeding the food through the chamber. Most of the items will move through the machine without the need for using the pusher. If you find that you need to use it, gently press down. Never jam anything into the machine because that will damage it. It is always best to work at a slow, steady pace, paying attention to the machine as it works. If the machine clogs, turn it off, and press the reverse button to unclog it. Between uses, this juicing machine does not always need to be taken apart for cleaning. Simply close up the juice tap, fill with water, and turn it on to allow for self-cleaning. The spinning brush whisks away any pulp that has become caught in the strainer. Allow it to drain, and repeat until it is free of any remaining pulp or residue. When you are ready to pull it apart for a good scrub, a large and small cleaning brush have been included for your convenience. A drying rack has also been included. There’s no info whether the Hurom H-AA Series is dishwasher safe or not. To be safe just place all the parts in warm, soapy water. Use the stiff brushes to scrub pulp from the strainers. Take the stiff cleaning brush and scrub the juicing screen to remove any remaining pulp. Ensure all of the pulp has been removed from the strainer screen. The Slow Squeeze Technology (SST) developed by Hurom allows the user to extract fresh, natural tasting juice. The quality is full-bodied and flavorful. It produces the highest possible yield by methodically pressing the produce, and expelling dry pulp as it juices. It operates more slowly than standard masticating juicers, which operate at 80 RPM, and centrifugal juicers, which operate at 1,000’s of RPM. With an auger speed of only 43 RPM and the spinning brush speed at only 17 RPM, the juice is gently mixed within the drum. It results in less froth and a better overall taste. In addition to a decadent taste, the juice is packed with nutrients, antioxidants, and vitamins. Plus, the lever allows you to control over the amount of pulp you allow in your juice. You can choose to have juice with pulp in it or go pulp-free—it’s all in your hands. You can easily create large batches that can be stored for consumption at a later time. A glass is the best type of container to use, but stainless steel and BPA free plastic are also fine. Fill it up as close to the brim as possible, tightly seal it, and drink it within 72 hours. This juice press can process all types of produce—soft & hard produce, citrus fruits, leafy greens, and some beans and nuts. Hard produce includes celery, yakon, beets, fennel, pineapple, carrots, pear, asparagus, pumpkin, apple, bitter gourd, garlic, ginger, sweet potato, cauliflower, turmeric, coconut, cucumber, broccoli, pepper, watermelon and cilantro. Using the coarse Ultem strainer you can efficiently process papaya, kiwifruit, peach, cranberries, strawberry, avocado, melon, grapes, mango, blackberry, pomegranate and tomato for making a puree. Leafy greens include dandelion greens, spring onion, peppermint, pine tree needles, wheatgrass, beet greens, collard greens, cabbage, moringa, kale, parsley, brussels sprout, basil, spinach, and lettuce. Citrus fruits include tangerine, lime, orange, lemon, mandarin, and grapefruit. As a bonus, you can also make soy and almond milk with it and best of all you can also use it to make ice cream out of frozen ingredients. The Hurom H-AA Alpha Series Slow Juicer introduces an improved technology that optimizes the taste and quality of the extracted juice. This Alpha juicer is a highly versatile machine, it can juice most produce including leafy greens, nuts, and soybeans. It comes with an ice cream strainer to produce delicious ice cream and sorbets by crushing frozen items such as bananas, mangoes, and strawberries. The spinning brush only rotates at 17 RPM, resulting in less foam build-up and overflow from the drum, which is a desired trait of juicers. It extracts a higher yield than most upright masticating juicers as a result of the slowly rotating auger. If you are at a loss on the different types of juicing recipes, it comes with a handy recipe book. There are some things to consider before opting to purchase this juice maker. It’s a masticating juicer and works more slowly than a centrifugal juicer. It is good for creating a juice surplus if you feel you won’t have time to juice every morning. The current market retail price is may be steep for some shoppers but is worth it when you consider how much you already spend at your local juice bar. It really adds up if you sit down and calculate it. Beyond the cost, even when visiting a juice bar, you can never be 100 percent certain they use proper preparation and cleaning procedures. When using a juicer like the Hurom H-AA Slow Juicer, you are in control of what you put into your body. What is your health worth to you?